Anywhere from 4 to 10 million Americans suffer from carpal tunnel syndrome every year, affecting their ability to work efficiently and even complete daily tasks. Hoang Tran, an occupational therapist in Miami, says it is among the top conditions treated each year at Hands-on Therapy Clinic. Occupational therapist in Miami explains that there is an actual tunnel on the palm side of the hand that is the passageway for the median nerve and for tendons to reach the fingertips. Compression of the tunnel, and subsequently the median nerve, cuts off blood flow, decreasing the nerve’s ability to function. Over time, if not treated, this can lead to permanent nerve and muscle damage. Carpal tunnel syndrome may occur if you spend a lot of time doing activities that involve forceful or repetitive hand or wrist movements or if you use vibrating equipment. These activities can include driving, working with small instruments, knitting, or using a sander. You should take care of your health holistically, not just tackle specific issues when they occur. The foundation for staying in good shape is a balanced diet, exercise and an avoidance of bad habits, like overconsumption of alcohol. Taking this approach can prevent you from developing many conditions, such as diabetes and bone problems, which make you more likely to get CTS. If you have a job that requires repetitive movements or, quite the opposite, you have a job which requires you to stay in one place for a long time (long static positioning), you must ensure your workspace is organized in an ergonomic way to ensure maximum comfort for your body with minimum damage. Arranging your daily routine and work space using ergonomic guidelines can help prevent carpal tunnel syndrome and back problems. Office ergonomics focus on how a workstation is set up, including the placement of your desk, computer monitor, paperwork, chair, and associated tools, including your computer keyboard and mouse. The same ideas can help you arrange the space you use for other daily activities. Proper body posture is the key to keeping your motor skeletal system in good condition throughout life. Pay attention to your posture, not only while working, but while sitting, walking or standing, says occupational therapists in Miami. Overall, your back and neck must be aligned (straight), not leaning forward or backward; ears, shoulders, and hips should be in one line with each other; legs should be parallel to the floor (not crossed) when sitting. When performing repetitive actions all day, you need to be sure you’re keeping an eye on the position of your hands and wrists. When you are holding something, it is also recommended that you reduce the force used and relax your grip. Your hands and wrists need breaks from time to time. The break doesn’t have to be long; a few minutes is usually enough. Set a reminder every 2-3 hours to take a short break; if you experience discomfort, make those breaks more frequent. During your breaks, you want to stretch and bend your wrists and hands, both backward and forward. After your break, you may want to consider switching hands or your position when performing repetitive activities. Consider trying wrist splints. If you have carpal tunnel symptoms and have trouble training your wrists to stay straight, try wearing wrist splints for temporary relief. These splints are not meant to be worn over a long period of time, but wearing them ONLY when you are sleeping can help you manage carpal tunnel syndrome in the long term. Stretch your fingers and wrist open and back. STOP squeezing your hands or squeezing a ball! It’s the worst thing you can do. It is not uncommon that even the doctors tell you to squeeze a ball when you tell them that your hands feel very weak. It’s not because you are “weak”; it’s because the nerve is being choked and slowing down the message to your muscles to work more. To keep squeezing the ball or constantly making a fist is to continue choking that median nerve even more! Bonus tip – don’t wait…get the help you need from a certified hand therapist to get the relieve you need before it gets WORST. While you wait in the hope thing will get better, they actually getting worse; numbness and tingles gets worse, you will have troubles sleeping at night because the night pain will keep waking you up….and you will be struggling during the day, you will have weakness of the hand and arm – just to name a few consequences of a delayed therapy. Want to know more about carpal tunnel therapy in Miami? 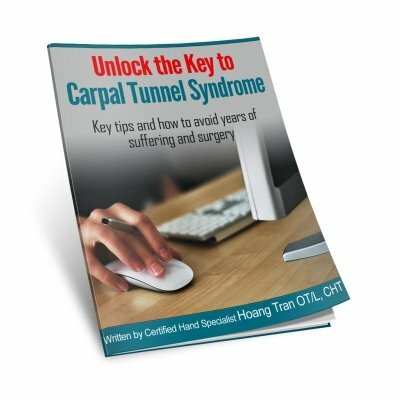 FREE : Claim this Carpal Tunnel E-Book with tips and advice on how to reclaim your quality of life back from Carpal Tunnel Syndrome without having to take pills and avoid painful surgery. Read more about occupational therapy in Miami or Contact Us. In addition to providing carpal tunnel therapy in Miami, we also provide hand therapy for other hand-related conditions, physical therapy, and massage therapy. Our Miami clinic offers an open and friendly environment where you will feel comfortable being treated by an OT/CHT in a one-on-one setting.